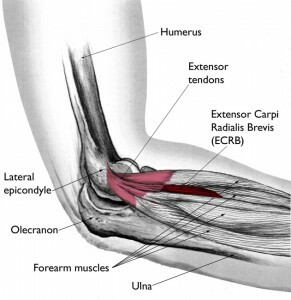 Lateral and Medial Epicondylitis also known as Golfers Elbow or Tennis Elbow are overuse injuries affecting the epicondyle passing through the Elbow. The treatment involves Dry Needling to the lateral or medial epicondyle called periosteal pecking (in rhythmic pace of 2 pecks per second) for 30 seconds to 2 minutes. Dry needling can also be applied to surrounding muscles in arm and forearm after identifying relevant trigger zones and also some shoulder muscles can be involved I the pain pattern and should be included in the needling and massage treatment. In addition stretching exercises and Muscle Energy Technique can be used in the treatment particularly to lengthen forearm flexor and extensor muscles.